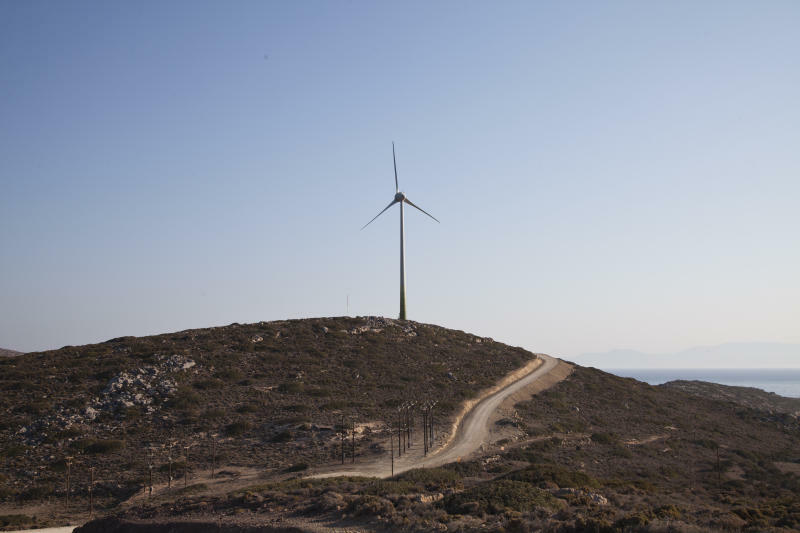 TILOS, Greece (AP) -- When the blades of its 800-kilowatt wind turbine start turning, the small Greek island of Tilos will become the first in the Mediterranean to run exclusively on wind and solar power. The European Commission says Tilos will be the first autonomous renewable green island in the Mediterranean. It plans to use the project as a blueprint for other small islands across the European Union that have limited grid connection to the mainland. The EU has largely funded the project, providing 11 million euros ($12.5 million) of the total 13.7 million-euro ($15.7 million) cost. "The innovation of this program and its funding lies in the batteries — the energy storage — that's what's innovative," project manager Spyros Aliferis said. "The energy produced by the wind turbines and the photovoltaics will be stored in batteries, so that this energy can be used for the grid when there is demand." The batteries store power during sunny and windy conditions, releasing it during periods of heavy demand and lower production — such as at nighttime and the peak tourist season — to keep the grid powered up. Named TILOS — Technology Innovation for the Local Scale Optimum Integration of Battery Energy Storage — the project uses a prototype battery system that improves storage of the excess energy generated until it's needed. Currently, Tilos gets its energy from an underwater cable that runs from Kos to the island of Nisiros and on to Tilos. That creates an erratic, outage-prone service that routinely breaks appliances and has forced many businesses to rely on diesel generators. While lacking the dazzle of other Greek islands like Mykonos and Santorini, Tilos — a 14-hour ferry ride from the mainland — is a quiet vacation spot that sees an average of 13,000 visitors a year. It's known as a green island, popular with hikers and bird watchers, and most of it is now a protected nature reserve. Mayor Maria Kammas saw a green energy system as the island's natural next step. "For many years now, Tilos has plotted a course that is dedicated to protecting the environment," she said. "We are seeking visitors — tourists actually — people who will visit our island who love the environment and want to protect it and nature as it was given to us." "I'm very optimistic about this project because there are few negative consequences as a business, and for the guests of the hotel that I run," says Delaporta. "People are pleased with the service because they have no problem with their fridges and they have no problem with their air conditioning. They are happy." With long sunny days and average temperatures of 33 degrees Celsius (91 degrees Fahrenheit) during the summer, tourists spend their mornings at the beach and afternoons napping. The island comes alive in the evening, when businesses open and residents and tourists alike flock to bars and cafes. Eva Lemaier has visited the island every year for more than two decades. Coming from the Netherlands, which has one of the world's highest environmental standards, she says Tilos' green policies stand out in Greece. "I'm also a little bit proud of Tilos about what they are doing now, with the renewable energy," she said. "I think it's good for the island not to be dependent on other islands." This story has been corrected to show that the Dutch tourist's surname is Lemaier, not Lemaire.